1 of 2 Bring a large, lidded pot of water to a low simmer. Add chicken breasts; cover and poach 10 minutes or until cooked through. Cool slightly. Dice and place in a large bowl with diced celery. 2 of 2 In a separate bowl, whisk together buttermilk, light mayo, Buffalo sauce, chives and dill. Pour into bowl with chicken. Mix well. 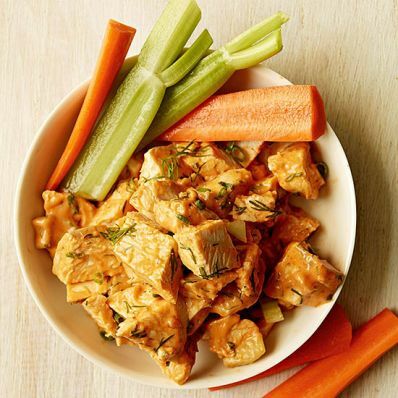 Serve with celery and carrot sticks. Per Serving: 244 mg sodium, 1 g sat. fat, 3 g carb., 0 g fiber, 34 g pro., 216 kcal cal., 7 g Fat, total, 88 mg chol.